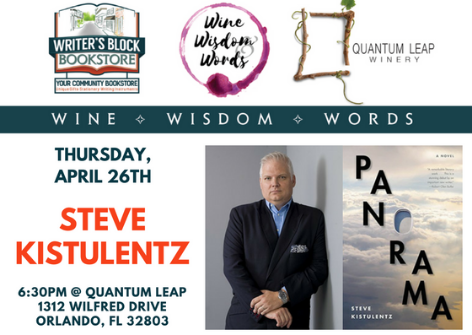 Writer’s Block Bookstore is delighted to partner with Quantum Leap Winery presenting the second author in our series of book talks, Wine ◊ Wisdom ◊ Words. On April 26th, at 6:30PM. Join us as we celebrate the publication of his debut novel, PANORAMA. A discussion and signing will round out the evening! About the book: In PANORAMA, debut novelist Steve Kistulentz traverses the rich inner lives of his increasingly connected cast of characters, from the very passengers of the flight to the unknowing crew on the ground to innocent passersby. 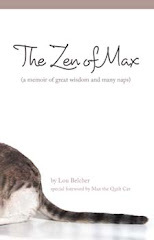 Richard MacMurray, a cable news talking head who must take stock of his own life when the crash transforms from just another tragedy gone viral, lives a distinct before and after. In masterly fashion, Steve Kistulentz manages to craft exacting and intimate portraits of human loss all while capturing the expansive, dizzying scope of public tragedy and grief. About the author: Steve Kistulentz, “a writer to watch” (Kirkus Reviews) will be reading from his debut novel PANORAMA, which was named one of the most anticipated books of 2018 and has been called “a great and promising debut novel” (Washington Book Review) and “a deeply moving meditation on the nature of family and home and a celebration of our redeeming capacity for optimism in the face of tragedy, hardship, and loss” (Library Journal). He is the director of the graduate creative writing program at Saint Leo University in Florida and now lives in Tampa. Prior to that, he spent fifteen years working in national politics in his hometown of Washington, D.C.